ActionSpace was launched in the 1960s and established as an independent charity in 1984. Our work with high profile cultural organisations such as the Royal Academy, Camden Arts Centre, the Museum of Everything, Outside In/Pallant House Gallery and the National Portrait Gallery has helped to establish a place for artists with learning disabilities in the contemporary arts sector. We aim to make a professional career in the arts a realistic option for artists with learning disabilities who have the talent and ambition to pursue this. At our three dedicated art studios based at Studio Voltaire in Clapham, Cockpit Arts in Holborn and ACAVA’s Flying Angel Studios in Canning Town, artists with learning disabilities attend weekly Studio Projects and receive guidance and mentoring from our specialist artist facilitators. This supports them to develop their practices and establish their own unique artistic signatures. 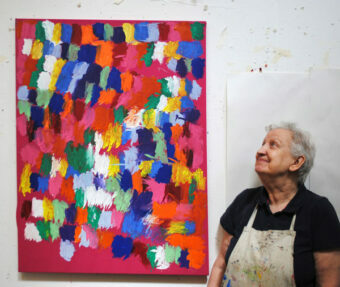 Picture: Artist Connie Moth-Price with one of her pieces.